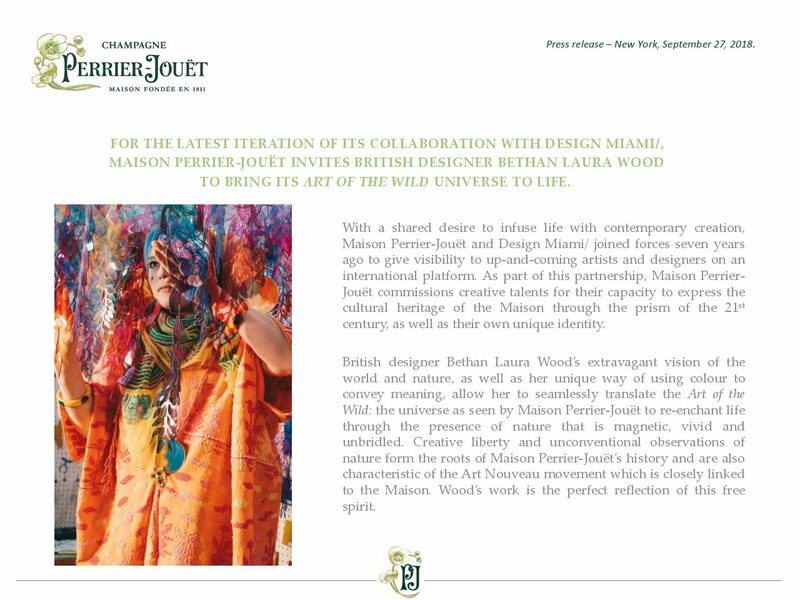 For the latest iteration of its collaboration with Design Miami/, Maison Perrier-Jouët invites British designer Bethan Laura Wood to bring its Art of the Wild universe to life. September 2018 - With a shared desire to infuse life with contemporary creation, Maison Perrier-Jouët and Design Miami/ joined forces seven years ago to give visibility to up-and-coming artists and designers on an international platform. As part of this partnership, Maison Perrier-Jouët commissions creative talents for their capacity to express the cultural heritage of the Maison through the prism of the 21st century, as well as their own unique identity. British designer Bethan Laura Wood’s extravagant vision of the world and nature, as well as her unique way of using colour to convey meaning, allow her to seamlessly translate the Art of the Wild: the universe as seen by Maison Perrier-Jouët to re-enchant life through the presence of nature that is magnetic, vivid and unbridled. Creative liberty and unconventional observations of nature form the roots of Maison Perrier-Jouët’s history and are also characteristic of the Art Nouveau movement which is closely linked to the Maison. Wood’s work is the perfect reflection of this free spirit. Blurring the boundaries between art and design, Wood strives towards creating pieces that encourage interaction both physically and intellectually, so as to stimulate a dialogue between user and object. 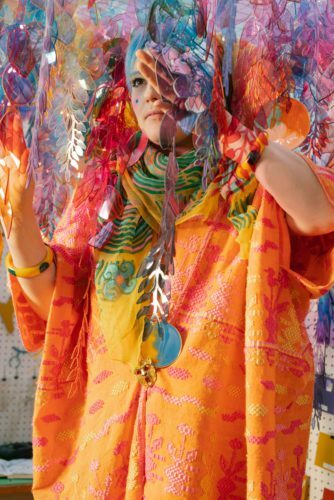 To inform her aesthetic, Wood takes influence from her travels which feed back into her work through enriched colour palettes, atypical forms and precisely selected materials. These elements allow her to elevate the mundane into the extraordinary, a practice in which Wood is well-versed. ‘Maison Perrier-Jouët’s connection to Art Nouveau really resonated with me, especially the way it breathed beauty into the world in the context of the industrial revolution. This moved me to choose industrial materials for this collaboration and work them in an artisanal way to reveal their beauty when treated with respect’, explains Wood. Bethan Laura Wood’s largest single sculpture to date, this collaboration with Maison Perrier-Jouët is a fantastical, immersive experience that will add a touch of enchantment to Design Miami/ from 5th December 2018, at the Collector Lounge.